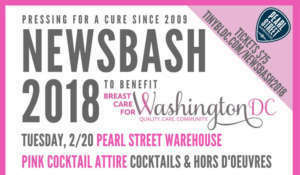 NewsBash, the breast cancer charity founded in 2008 by Washington-area anchorwomen, announces the return of its fundraising event on Tuesday, February 20, from 7:00-9:00pm at Pearl Street Warehouse. Supporters, survivors and friends will come together for the evening to help raise awareness for breast cancer and to raise funds for this year’s beneficiary, Breast Care for Washington, whose mission is to reduce breast cancer mortality in the Washington, DC area by promoting access to breast cancer screening, diagnostics, and treatment to all women regardless of their ability to pay. WTOP’s own Hillary Howard is part of the Newsbash committee, along with NBC4’s Lauryn Ricketts, Angie Goff, Melissa Mollet, Eun Yang. Pink Patron tickets are $75, and include an amazing night supporting a great cause with the most newsworthy women in town. Or support the cause with our new Mammogram Maven ticket, which covers the cost of one mammogram for an uninsured woman at Breast Care for Washington, and gets your name listed on event signage PLUS you’ll land a coveted VIP bag worth over $200 and filled with the NewsBash committee’s favorites! Mammogram Maven tickets are limited to 50 attendees.